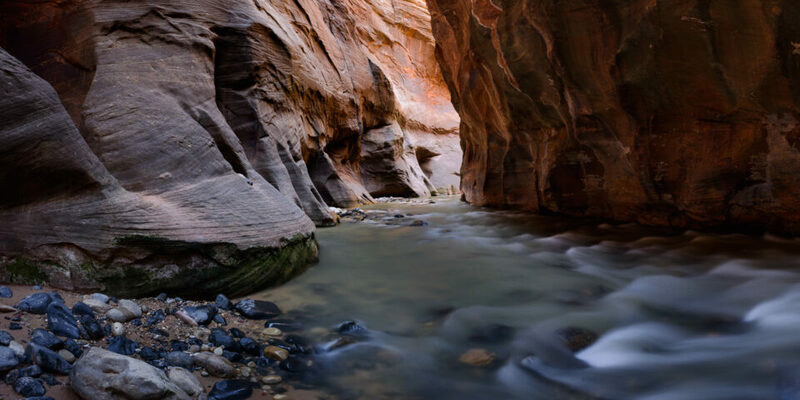 Perhaps the most famous sight in Utah’s Zion National Park is the Narrows, a slot canyon carved by the Virgin River. The dramatic patterns in these sandstone cliffs are some of the most beautiful landscapes in the country, making for incredible images. I had the opportunity to photograph this amazing sight last month, which was not a particularly easy endeavor. Some of the most beautiful parts of the Narrows are only accessible after hiking upstream through the river for several miles. 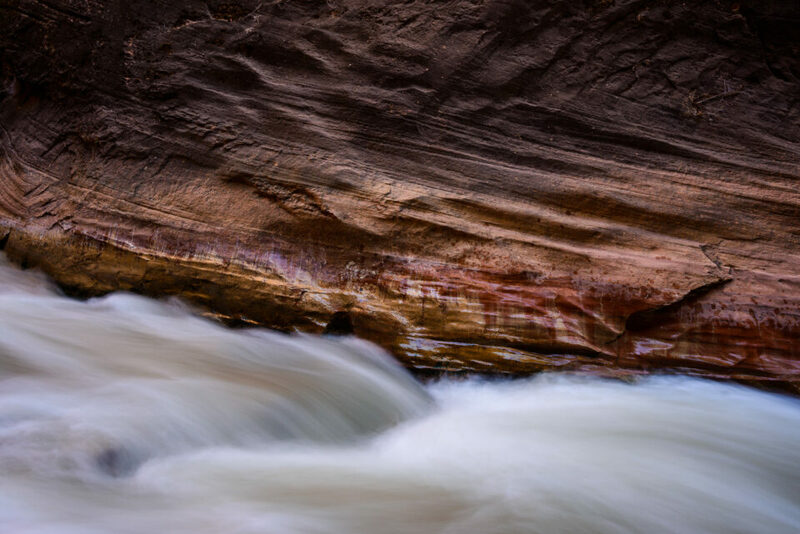 If you decide to hike up the Virgin River, the most important consideration is safety. The river moves very slowly, but it can get quite deep at parts. A drysuit (or wetsuit) is essential if you are making the hike during the spring, as I did. The river can get incredibly cold, and there is no way to quit mid-hike. A few companies right outside Zion rent drysuits, although you need to arrive early in the morning – 7AM or so. By 9AM or 10AM, most places will be out. If you photograph the Narrows during summertime, a drysuit may not be necessary. There are a number of islands and river banks along the way, which makes it easy to catch your breath if you need to. These also are the best places to take photographs, assuming that they provide the perspective you want. If it weren’t for places to rest, this hike would be even harder – several miles/kilometers though the middle of a river is extremely exhausting. Another important consideration is to keep your camera equipment dry. This can be tricky. If you walk through waist-high water – or, on some days, even deeper – there is no perfectly safe way to carry a camera (unless you happen to use an underwater housing). This is particularly true walking through a stone-filled riverbed; I nearly fell a few times, and I saw several people who did. I was lucky that my camera didn’t get wet, but I also took as many steps as possible to prevent any water damage. I only had a single camera and lens, which meant that I didn’t need to worry about changing lenses in the middle of the river. I hung my tripod off the side of my bag, since it could get wet without a problem. More importantly, my camera was inside of a kayaking dry bag, which itself was inside of a trash bag. Even if I fell – in theory – no water would reach my camera. That said, I’m glad I didn’t have to test it! If you have a spare camera, you might consider bringing it along instead of your main one. Although I brought my main camera, there were a few times that I would have preferred a backup instead. In terms of equipment, the most important gear to bring is a wide-angle lens. 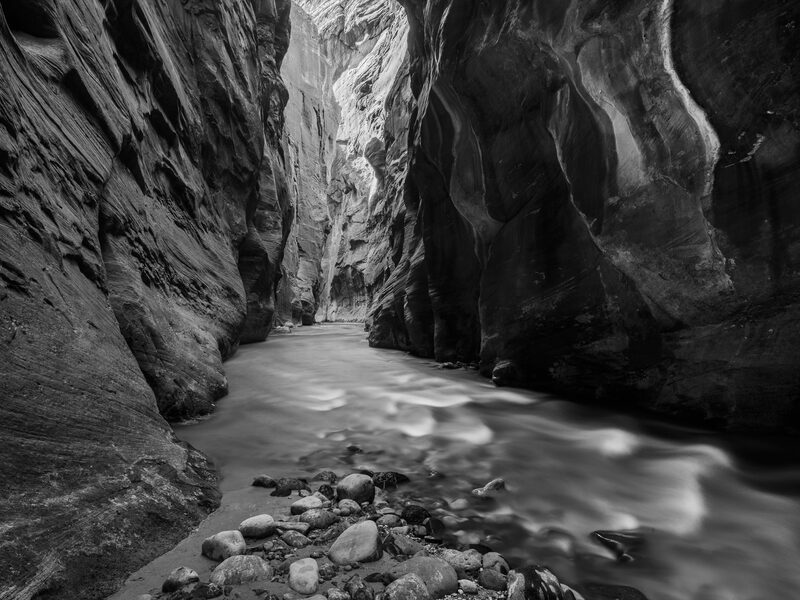 For the most part, the Narrows are so narrow that it is difficult to use anything other than a wide-angle. However, this is a generalization. There certainly are wonderful detail shots at certain points along the hike, so feel free to bring a telephoto if those are the photos you want to take. If your lens allows, I also strongly recommend a polarizing filter. 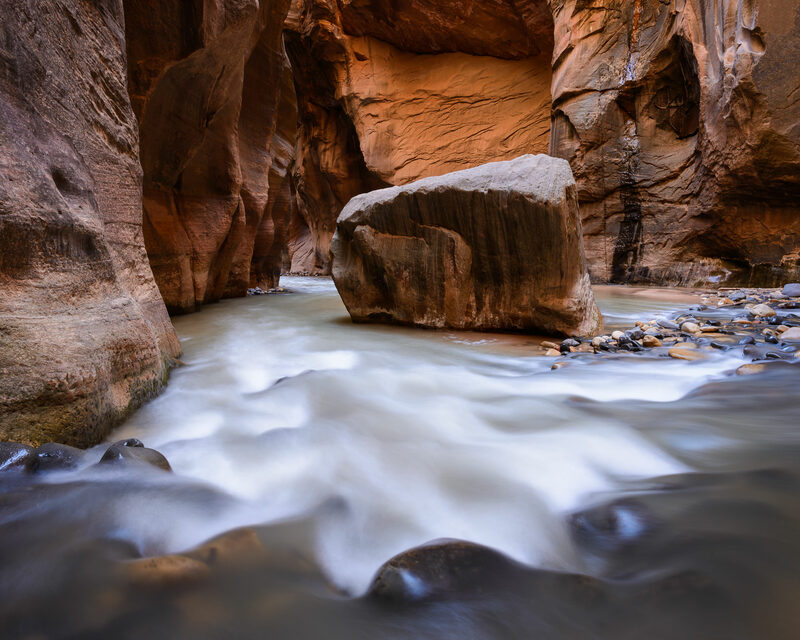 There are so many sources of glare in the Narrows – the river, the canyon walls, and even tree leaves – and a polarizer will make your images significantly simpler. A tripod also is a necessity; the Narrows are so dark that your shutter speeds may be several seconds long – even in mid-day. Plus, the water in your photos will look more natural with a slow shutter speed. One of the most difficult parts about photographing the narrows is avoiding people in your images. Countless times, other hikers passed through the frame that I had set. There’s nothing wrong with this at all – the Narrows are a beautiful place, and thousands of people enjoy them every day. As a photographer, though, I often prefer to take landscape images without other people in the frame. I was lucky enough to visit the Narrows during the spring, which meant that they weren’t particularly crowded. Even then, though, I had to wait several minutes for people to leave some of my images. I imagine that this would be even more problematic during the summer. If you don’t want to wait a few minutes for people to cross through your frame, you might consider blending two photos together. For example, take an image with people in one part of your frame, then a second once they move to a different part. Layer the two photos, then blend out the people in Photoshop. Although it isn’t perfect, there may be no other way to take the photos you want on a crowded day. Finally, it is worth noting that the Narrows can change significantly at different times of year. There are a few points along the hike where full-grown trees have taken root; these look beautiful during fall and late summer. Unfortunately, none of them had bright leaves while I visited – all the more reason to return! I also visited just a small section of the Narrows hike (up to the “Wall Street” section). There are countless other landscapes to visit on the Virgin River, including some that have waterfalls and even more trees. If you are in Zion for a while, I strongly recommend exploring. Zion, like all National Parks that I have visited, is only crowded at the most famous spots. There are people everywhere, of course, but it is easier than you’d think to find an amazing place all to yourself. Although I only had a single day to photograph Zion’s Narrows, it was one of the most memorable days of my life. The hike is tiring and cold, but it was completely worth the effort – both in photographs and in memories. You’re right. The Narrows is a truly splendid natural wonder. It has to be one of the best walks ever. Last end-of-summer we did not need wet/dry suits up to Orderville Canyon point. Picked up “boots” and walking stick the evening before we did the hike from the local provider so less hassle. We found that by shooting bracketed shots and processing using HDR, we were able to bring out more detail in the darker rocks. Also the trees were fully leafed then. As usual, you get what you get when time is limited. While in the Narrows it started to rain. As per recommendations, everyone beat a hasty retreat. Your photos are lovely and I enjoyed viewing them. But I really think that you should think about just photographing the water as is. Water is beautiful as itself, without the time exposures which I think are something of a cliché. 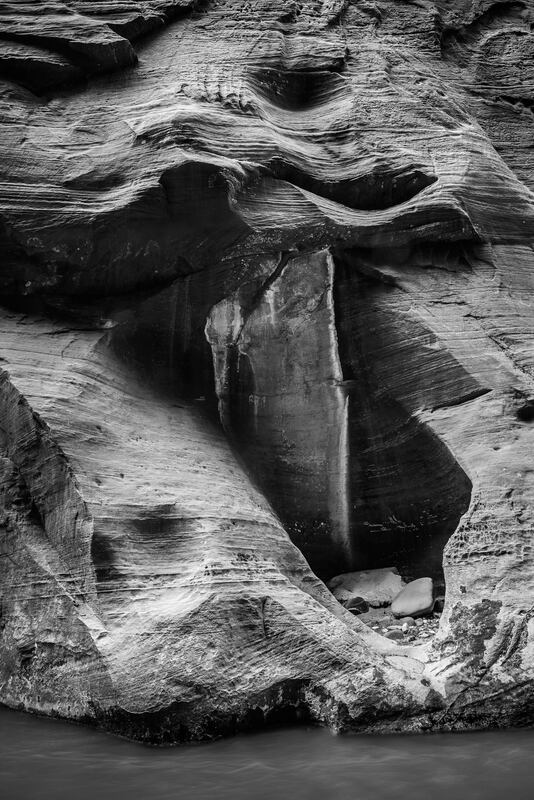 To me, I would have been excited to see these canyons in their natural state, as I will probably never get to see them in person. Nature is a much better artist than we are, which is something I always try to be mindful of when photographing its wonders. I was in the Narrows last summer. I was shooting with the Panasonic Lumix FZ150 (my camera of choice for wet hiking!) and did not carry a tripod. Even so, I was able to get decent images with some careful shooting. I even shot the water at 1/20 second so that it gets a very slight sense of motion. Anything shorter, however, would result in an underexposed image. Each to their own surely? I’m sure he did think of the options and chose his preference. All interpretations are valid. Very nice pictures. I love the colors. Nicely done! Great article and photos, Spencer. Thanks. That’s a place I’ve always wanted to get to with a camera, but I’m afraid that, due to getting older, I’m just going to have to enjoy your shots. Jim, in comment above, is 72 YO. Maybe it’s not too late? What about visiting during fall or winter? Is it closed, or just too darn cold? Both, mostly! Anytime of the year with high water flow will cause it to be closed. Further, you can’t get permits for the longer hikes in the winter because there is not enough daylight to complete the hike safely. Stick to summer months with no rain in the forecast. In these conditions, it’s stunning and safe with any reasonable precautions. I have done this many times and taken the permit only longer hikes a couple times. Note that at my age, I probably can’t complete the longer hike from Chamberlains Ranch in the allotted time. You need to move fast and have plenty of endurance. We went last December, to the end of Wall Street and back. The dry suits are very warm, so there is no problem with the cold even though the water is only 4C. We started about 9:30am (the rental store only opened at 9am), and finished around 2:30pm. Very few people, especially on the way there, and certainly no issues with other people entering your shots. Fall is wonderful time to go. From November 1st the road is open to cars, so one doesn’t need to rely on the shuttle. Plus, fall color begins there around the beginning of November. The last time I shot Zion was in the fall of 201l: NO CROWDS. Also, the Virgin River is pretty much at its lowest and the threat of rain is minimal. Sunset at the Watchman is great with the added fall color along the riverbanks, but get there at least 2 – 3 hours early for a prime spot on the bridge over the water to beat the horde of photographers wishing to do the same thing. In fact, I was hiking to Middle Emerald Pool, when almost there, here came a photography workshop group back from the pool. The leader of the workshop stopped me and we talked a bit. Seeing my equipment, he saw I was serious about the craft, and began giving me a ten minute impromptu workshop lesson on shooting the pool and its environs. How cool is that? When I went back to my hotel room that afternoon I plugged in his name in my laptop, Ian Plant. Incredible photographer! I’ve attended at least five different workshops led by five different well-known leaders. Some were downright nasty, but Ian took the time to pleasantly coach a stranger not even in his group. I vowed one day to sign up for one of Ian’s workshops in the southwest, but alas, he hasn’t offered one out here since. Sorry for the ramble, but Ian sure impressed me, and how a caring and knowledgeable workshop leader can be gold. You are getting to all the great places! Congrats, and also, nice pics! I was at Zion last September. I like going down to the river and photograph the area before the narrows. Because of the positioning of the mountains on either side, late morning in the fall both sides are lit up. I use a mini tripod and knockout filters for the water. Just a safety note. If there is any chance of a storm in the area – do not go in the gorge. Yes, that is absolutely true, and something I neglected to mention. Even on a sunny day, distant storms can cause flooding in slot canyons throughout the park. Always consult the park rangers. Sorry… I don’t like the shos. The exposure of the water is just too much. We will be at Zion for the very first time i na couple of weeks. Do you know if a wet suit is still needed for the leisurely hiker at the end of May? Hi John, you wouldn’t need a drysuit at the end of May, although I would still recommend one if you can get it. I went at the end of March, and some people didn’t wear them. However, be sure to check the water temperature ahead of time. All that info is posted at the front of the park. SUMMER SAFETY NOTE for THE NARROWS: Late summer is monsoon season in this part of the country which equals severe flash flood danger. July and August are usually the wettest months, but the monsoons can come sooner and stay later. The monsoons can come every day straight for weeks on end and rain volume can be very localized which means that even if it looks clear and dry at the Narrows, a thunderburst above any of the drainages many miles upstream can cause lethal conditions. Heed the rangers’ warnings! If you want to photograph the Narrows I strongly suggest visiting at a different time of year. 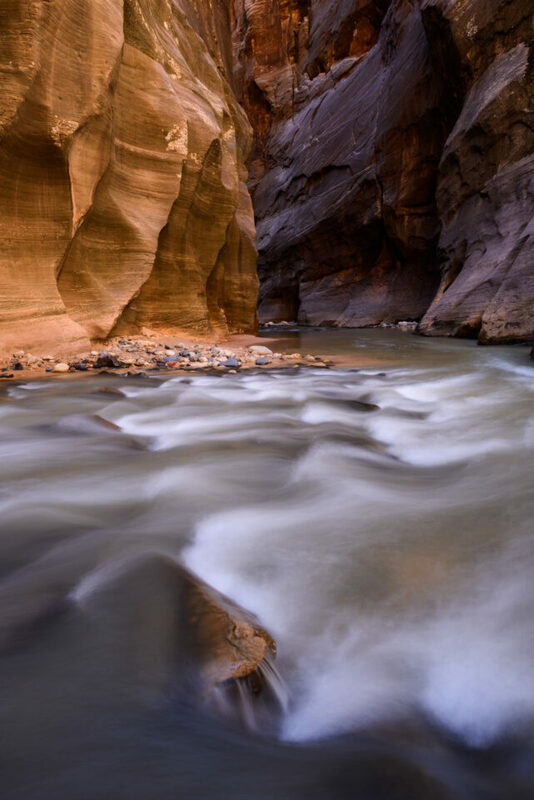 Summer gives the lowest probability of a safe visit and if a flash flood comes down the Narrows there is absolutely no way to escape as the steep walls in Spencer’s shots make clear. Over the years there have been a lot of flood fatalities in The Narrows. On a less scary note, on my visit I was shooting on tripod with a low shutter speed when an amazing buck trotted down the canyon. I tried in vain to get the shot with no time to readjust exposure – just lift the camera with tripod attached and try to pan as best I could. Though I got some some nice landscape shots that day what I most fondly remember was that rare moment. Sometimes photography isn’t about getting the shot, it’s about being in the moment. Thank you for adding this — the Narrows are beautiful, but they are prone to flooding at certain times of year. Even if it isn’t raining in the area, distant storms can flood slot canyons that are many miles away. Listen to the rangers! the Northwest and shoot there. Thanks Art, I’ll let you know next time I’m shooting up there! Going there for a day trip in two weeks. Do you think ND filter is necessary? I was thinking of bringing the little stopper. Would it be too much? I did bring an ND filter, but I didn’t end up using it. More importantly, I used a polarizer for all these photos, which I strongly recommend. As you can see from the photos in this article, I used an aperture of f/16 fairly regularly, and my shutter speeds hovered from 1/2 second to 5 seconds. Even at 5 seconds, I ended up with a bit of detail in the water, and that was at the darkest part of the narrows. So, if you’re interested in 20+ second exposures, which should eliminate most of the texture in the water, you should bring along an ND filter. Most importantly, though, bring a polarizer. It only acts as a 2-stop ND, but it will improve the appearance of the water quite significantly. If you want to bring along an ND, the little stopper is a very good one, but I wouldn’t consider an ND in general to be the most crucial equipment for your trip. It all depends upon your goals for the photos, though.